Welcome to our new monthly series, in which we profile a happy hour of our choice — or yours. Email us at happyhour@courant.com with your suggestions. 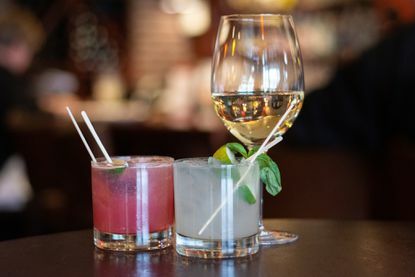 As far as Greater Hartford happy hours go, Max Restaurant Group’s locations are some of the best, going above and beyond to offer intriguing small plates and specialty cocktails at a discount for your post-work or late-night pleasure. Max Amore in Glastonbury is no exception, its elevated happy-hour offerings influenced by its northern Italian focus. While its neighbor Max Fish often fills up within minutes of its happy-hour start time, with guests clamoring for $1.25 oysters, Amore’s menu shouldn’t be overlooked, with a mix of comfort fare and unexpected delights. Food: On an Italian menu, you’ll expect to find fried calamari, and Amore delivers, with cherry peppers, basil aioli and spicy marinara. But two of its standout plates are vegetable-focused: individual burrata-stuffed squash blossoms, fried and served with arugula and olive oil-stewed tomatoes; and carciofi, crispy fried long-stem artichokes with pink peppercorn aioli and grilled lemon. Herb-grilled lamb spare ribs are also unusual, served with yogurt sauce and lemon. If it’s pizza you’re after, choose from four oblong-shaped stone pies: a classic margherita; pollo with marinated chicken, asiago, pine nuts, gorgonzola and caramelized onion; polpetti with meatballs, ricotta and Taggiasca olives; and hot coppa, with spicy coppa ham, fresh mozz and Calabrian chile. Drinks: An array of seven cocktails, available for a fiver apiece, offer classics with a twist, like a grapefruit cosmo with elderflower liqueur, a gimlet with muddled basil and a margarita with cherry syrup. Max’s Brewtus Maximus proprietary pale ale is the base of a spiked shandy, with house sour and citron vodka, and the Lime in the Coconut lends a tropical air with coconut rum, lime and demerara. Italian Peroni beer is available by the glass and pitcher, and wine selections by the glass include pinot grigio, prosecco, rosé and montepulciano. Prices: Small plates are $3 to $5. Stone pies are $5 and $6. Cocktails and wines are $5. Beer is $4, with the Peroni pitcher available for $10. There’s a $5 minimum beverage purchase per person. Hours and details: Happy hour is available daily from 3 to 6 p.m. in the bar, lounge and patio areas only. No takeout or substitutions. Max Amore is at 140 Glastonbury Blvd. in Glastonbury. 860-659-2819 and maxamore.com.